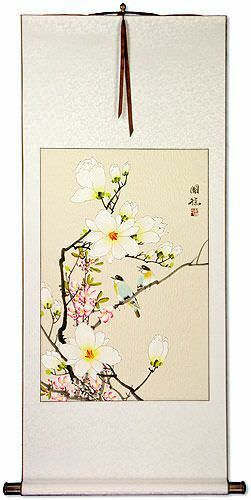 Buy a Blooming calligraphy wall scroll here! 華 is really open to interpretation. 華 meant flowers or blooming in ancient China. It still has that meaning in Japanese, and Buddhist context. In modern China, this means glorious, beautiful, splendid, magnificent, or the best part of something. It can also refer to the country of China or something Chinese (such as people - overseas Chinese are often called "hua ren"). 華 is also a surname in China. In Japanese, this can be the female given name "Ririka." It's also the short name for a certain kind of playing cards in Japan. In Korean, This can be the surname "Hwa." While it also means splendid, flowery, or the country of China in Korean. Some people may refer to this entry as Blooming Kanji, Blooming Characters, Blooming in Mandarin Chinese, Blooming Characters, Blooming in Chinese Writing, Blooming in Japanese Writing, Blooming in Asian Writing, Blooming Ideograms, Chinese Blooming symbols, Blooming Hieroglyphics, Blooming Glyphs, Blooming in Chinese Letters, Blooming Hanzi, Blooming in Japanese Kanji, Blooming Pictograms, Blooming in the Chinese Written-Language, or Blooming in the Japanese Written-Language. 21 people have searched for Blooming in Chinese or Japanese in the past year.